Concluding Hideo Kojima’s stunning Metal Gear Solid saga, Metal Gear Solid 4: Guns of the Patriots Platinum is set in a battle-scarred future where huge conglomerates fight for supremacy using armies of hand-picked mercenaries. 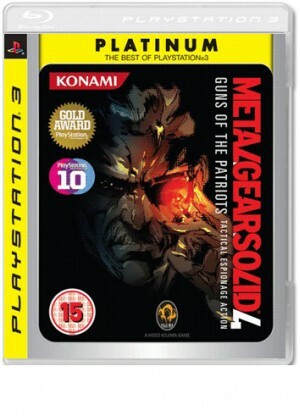 The devastated world of Metal Gear Solid 4: Guns of the Patriots Platinum is seen through the battle-weary eyes of an older Solid Snake who has been charged with infiltrating a number of key locations across the globe, including the Middle East and South America. As such, Metal Gear Solid 4: Guns of the Patriots Platinum will be an epic end to Snake’s story, offering ground-breaking combat elements and a refined control system that offers unprecedented control over the aged hero. Compellingly, Metal Gear Solid 4: Guns of the Patriots Platinum will also tie up all the key plot lines and loose ends of the Metal Gear Solid saga.